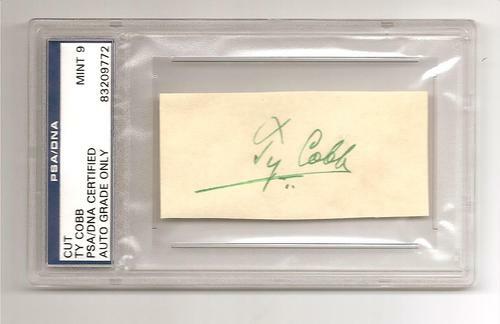 PSA/DNA authenticated this Ty Cobb signature as genuine after someone cut up an authentic Ty Cobb check. The signature was written by Cobb's wife. Any authentication company specializing in baseball autographs and charging a fee for its services should know Ty Cobb’s signature like the back of its own hand. The Georgia Peach’s scrawl is quite distinctive and authentic exemplars from every stage of his life are abundant for the experts to study. Cobb autographed items regularly flood the big auction house catalogs and eBay stores as highly marketable commodities. That being said, we’ve recently seen big authentication companies like PSA/DNA and JSA (James Spence Authentication) make critical errors in authenticating forged Ty Cobb signatures as genuine. One was a bogus signature signed on a baseball manufactured almost fifteen years after Cobb’s death (reported on Deadspin) and another was a suspected laser-copied forgery of a genuine Cobb autograph that PSA/DNA certed and encapsulated in one of its cut signature holders. The item was removed from eBay by its fraud division after being listed for sale for almost $2,000. No one knows for sure what has since happened to the item and it still appears in the PSA database as genuine. Now, it appears PSA has made an even more egregious error in relation to another Cobb item; they have certified and slabbed as authentic, a cut signature that was actually signed by Ty Cobb’s wife. EBay seller, “khw,” a top rated seller with a 100% positive feedback rating, listed the cut along with two others paired with Perez-Steele cards of Cobb. The three cuts appear to have been submitted together and have PSA registry numbers in succession. Two of the cuts were authentic, but the third was signed by Mrs. Cobb. The “Tyrus R. Cobb” that PSA authenticated in no way resembles an authentic signature of the baseball legend. In particular, the letter “T” in “Tyrus” is executed in a formation that does not resemble any authentic Cobb signature. That fact alone should have tipped PSA off. Further research should have revealed other specimens of Mrs. Cobb’s handwriting that would have confirmed for PSA that the alleged signature was not signed by Cobb. One would think that an operation like PSA, a subsidiary of public company Collectors Universe (CLCT-NASDAQ), would have exemplars of Mrs. Cobb’s handwriting at their disposal? The seller (or another party) appears to have taken an authentic check signed and endorsed on the back by Cobb, himself, and then sliced up the check in order to have “cut signatures” encapsulated by PSA along with the Perez-Steele cards. Checks have long been considered the safest medium for collectors to acquire a genuine signature of a Baseball Hall of Famer, and even trading card companies have cut up authentic checks to create special cards for contemporary issues. This authentic Cobb check was cut up and submitted to PSA for authentication and encapsulation. The check was originally sold at R&R Auctions. When the check was authenticated by PSA and Steve Grad in 2006, they recognized the check itself was written out in a different hand. However, when the three cut signature items were recently encapsulated, PSA certified the handwriting of Mrs. Cobb as a genuine Ty Cobb. PSA had to have examined all three cuts at the same time and still failed to recognize that the third signature was not Cobb. All of this, with PSA having originally certified the item correctly for R&R in 2006. The eBay seller with the user name “khw” appears to be one of PSA’s big customers. The registry numbers on his three Cobb items do not currently appear in the PSA database. The three alleged Cobb cuts were removed from an authentic check and authenticated by PSA/DNA. They were submitted at the same time as evidenced by their successive PSA registry numbers. The source who gave the tip to Haulsofshame.com in regard to the Mrs. Cobb signature first reported his concern that all three of the cut signatures slabbed by PSA, along with the Perez-Steele cards, may be laser- printed forgeries. He suspected they were like the other example removed from eBay a few months ago. However, upon closer examination it appears it is more likely the cuts are actually from a check and not laser copies. Of course, in both situations, one could only be certain if the questioned documents are removed from their plastic tombs. The alleged Cobb autograph removed from ebay last month appears to have been created from an authentic signed post card owned by Cobb expert Ron Keurajian. Experts believe the forgery was created via laser printer, but the eBay seller and original PSA submitter, Donavon Arabie, claims that he sent the item back to PSA and was told the Cobb was the creation of a master forger using a pen. He also threatened to destroy the cut by burning it. Hobby veteran Richard Simon has called out Arabie on collector forum Net54, asking him not to destroy an item that, if examined in person, could shed some light on how to properly expose these types of forgeries and also help ascertain how often laser-copied forgeries are certified as authentic by PSA. Arabie, however, has vanished from the memorabilia scene and has not responded to inquiries. Simon and another collector, Travis Roste, have been vocal in challenging Arabie and both doubt that he ever sent the slabbed cut back to PSA/DNA. Arabie did not respond to our request for confirmation that he sent the Cobb cut back to PSA. The eBay fraud division removed the latest “Mrs. Cobb” cut last week after it was being offered by seller “kwh” for $1,175. It appears eBay has also removed the other two cuts paired with Perez Steele cards. Sources indicate that there are still lingering questions as to whether those two cuts were authentic or laser-copied forgeries. We asked PSA/DNA CEO, Joe Orlando, for an explanation as to how Mrs. Cobb’s handwriting was certified as an authentic Ty Cobb autograph and also for PSA’s explanation of how the company certified the alleged laser-printed Cobb forgery that was removed by ebay’s fraud division last month? We also asked Orlando if he could confirm that Donavon Arabie had sent his PSA-slabbed Cobb cut back to the company for examination? Orlando did not respond to any of our inquiries. Considering the likelihood that his experts have already slabbed a laser-copied Cobb forgery, Orlando has to have some doubts about the thousands of other cuts PSA has certed. PSA customers, dealers and collectors we spoke with are understandably concerned. Another victory! Keep up the great work! If Ebay really knew how many fakes are listed, it would stagger them! The ebay seller with the slabed cuts and perez steele cards has lots of others that look very suspect, some of them look really bad. Are you checking into those too? Just noticed that the third cut signature(slabbed with the Perez-Steele card) could not have been the endorsing signature from the R&R check: it’s on paper with a serrated edge, while the Bank of America check has clean edges. Go get them Peter, you have been 100% right on the money all along and have put some of the so called high and mighty authenicaters asses on the wall. Bill, It does look that way, but the R&R images of the front and back of the check could be cropped and do not show the entire check. I can’t tell for sure, but it is a possibility. That might explain what you’re seeing, but the only way to know for sure is to see that cut outside of the holder and the actual photos R&R shot of the check when they sold it. And was part of the famed Dreier Collection! HOW????. Wow, nice find. So, if Legendary sold the check again in the last two months, the ebay seller would likely have been the buyer. When PSA certed it in 2006 they said it had two cobb sigs and by the time it was slabbed by them and sold at Legendary, it became “thrice signed”. When the check was taken out of the holder and chopped PSA was just following their “thrice signed” opinion, even though the third sig was clearly not Cobb’s. Nice article. I`m not much of a collector, but I find these `cut` autographs to be one of the stupidest phenomenah I have ever seen. Destroying original documents with historical value like that just so they can fit into a plastic holder (or card) which 30 or 40 years from now will have no real historical interest or value is just beyond reprehensible. The fact that they compound the injury by also certifying non-authentic stuff just takes it to a new level. Looking at the back of the check when it just sold at legendary, it lookd like only one edge of thecheck was perforated. That pretty much matchesthe cut in the psa holder. I’d say that’s an original and they got that right but how could they examine the Mrs. Cobb three times and screw that up. After looking at the Legendary check photos, it looks like the R&R auction photo of the back of the check was actually cropped. I’d have to say the cuts in the PSA holders were cut from the Legendary check, but how the Mrs. Cobb was certified twice after it was first identified as another person’s handwriting (other than Cobb) by PSA in 2006 is what has to be explained. the person buying the “thrice” signed cobb from legendary would have some recourse because he bought what he thought was three cobb signatures and he only got two for his money. psa should know better when it comes to cobb, they should take their time, do it right. 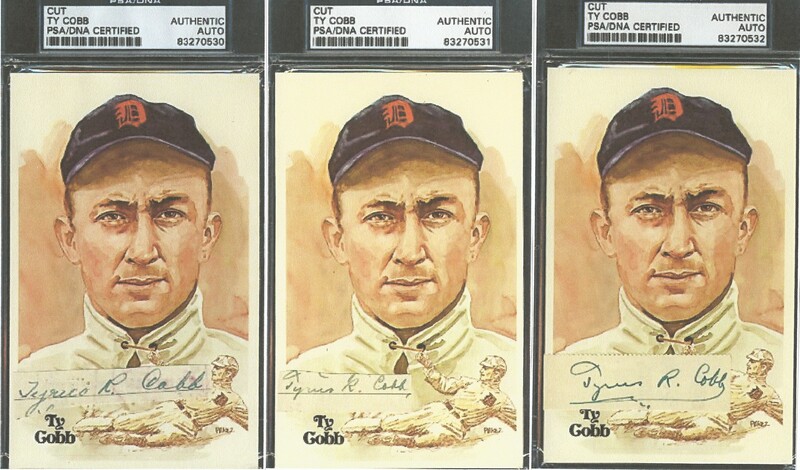 How they can see the T in Ty in the wife signed example and think it has any chance of being a real Ty Cobb I will never know, but the guy on the clock at psa looking at these could be anybody, who knows. They certainly won’t let us know. Calling Joe Orlando? Thanks very much for your comment and the additional information you provided. Just curious if PSA is reimbursing you for 1/3 the Legendary hammer price or your listed price that was on eBay? Also, did PSA admit to you that they made an error on this one? Thanks again for the information. 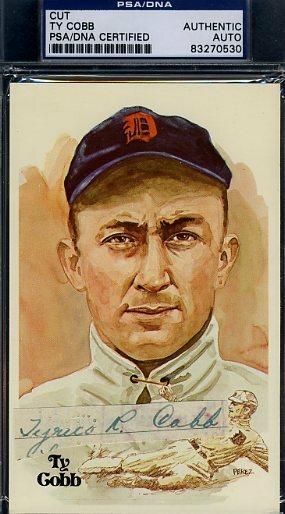 Many collectors and dealers have voiced their opinion that since PSA appears to have authenticated at least one laser-copied Ty Cobb cut, they are skeptical of all slabbed PSA cuts. Considering cut signatures are the most treacherous of all autographed items to collect in the first place, this scenario has only added to the concern that PSA is certifying non-genuine cuts on a large scale. It looks like you have submitted a large number of cuts to PSA recently. How many of your submitted cuts did they reject in the past 6 months? thats why i only collect licensed trading cards that i know, by contract, the person in fact did sign the item. I would stay away from cuts all together. If you do not have proof that the autograph is 100 percent real then it should not be in your collection and should not be sold. Why has the original article not been updated to reflect that the check was purchased by the seller a few months ago and that the check at that time had all three signatures authenticated? The article appears to make several insinuations of misconduct by KHW, but as the comments clearly demonstrate, he did nothing wrong. If you read this article as part of the thread of articles, however, and not as an individual post, you don’t see the comments and thus makes it appear KHW engaged in wrongdoing. The responsible thing would be to update the post to reflect the new facts from the comments. Excellent article. Underlines the quandry many of us face when getting signatures authenticated. Who can you trust? Who can you trust all the time? I had a Lou Gehrig rejected by JSA but authenticated by the Academy of Manuscript and Autograph (AMA) and the Authentic Autographs Unlimited (AAU). What can one do? I know of no authenication service that has not been tarnished by fakes and faulty analysis. I appreciate these types of articles and the comments as it helps me understand this field better. Thanks to all. Thanks for your comment. We are planning to update the article with that information, but we are also waiting on some additional information. Because this is Nash’s style. Surprised REA didn’t get blamed for this one. To go along with his style, this comment will soon be deleted by him. -quote from KHW in post #24. How many might have been passed already though, that is the question. Would someone who did it once successfully not want to try and try again? Who knows how many cuts that are in plastic tombs are computer generated copies? And I don’t think the seller can qualify as telling “some truth” when he told Net54 that PSA said it was a high quality hand signed forgery. IMO that does not qualify as any truth at all. Still waiting for that apology. PSA DNA has a terrible track record for online opinions. Who is there 24/7 that gives opions in minutes ? Are they experts in everything? They do not need research ? How can anyone make any sort of “Guess” using an image on a screen ? I saw an LBJ Autopen signed book on eBay that was PSA DNA Authenticated. I saw a common Dustin Hoffman Pre-Print with a PSA DNA Certification. What a waste of money ! $ 10 for an OPINION that has no merritt , no legal anything. The ten dollar opinion is a big con . Are we sure that any signatures we purchase are authentic these days. I’m not even sure the authenticators know what the real signature looks like. It seems as if these authentication companies are trying to control the sports world. I don’t know about everyone else but I’m afraid to by anything out there.